Slice off the top and the bottom of a large watermelon and set it flat on a plate or cutting board. Cut off the rind of the melon with a filet knife. Cut all of the white part between the rind and the watermelon off. Rotate watermelon as you cut and try to keep a nice even cylinder shape. If the cylinder is too tall for you "cake" then cut it down on one end until you get the height you want. Remove the top, skin, and core from the pineapple. Slice into thin pieces then cut them in half. Arrange the sliced pineapple pieces along the bottom of the watermelon, with the curved part of the pineapple slice up on top, and secure with toothpicks, taking the pineapple all the way around the cylinder of watermelon. Wash the strawberries, remove the tops, and slice in half. Chose strawberries that are all about the same size and shape. Using a toothpick, secure the strawberries where two pineapple slices meet at the bottom. Wash, slice, and pit the cherries. Using a toothpick secure about three cherry halves between each set of strawberries. You can also use whole blackberries or raspberries in place of the cherry halves. Take more pineapple slices and cut them in half but make one side of the slice a little bit smaller than the other. Arrange the pineapple pieces along the top edge of the watermelon, with the curved part of the pineapple slice on the bottom, and secure with toothpicks, taking the pineapple all the way around the top rim of the cylinder of watermelon. Slice the ends off the cantaloupe and the honeydew melon then continue slicing each end in 1/2 inch thick slices until you get to the part where the seeds start showing in the middle of the slice. Lay the melon slices on a plate or a cutting board and taking a sharp paring knife cut out a flower shape with 4 petals. Alternate the orange cantaloupe flowers and the green honeydew flowers and secure them around the cylinder of watermelon between the pineapple slices. Add a blueberry to the middle of each of the flowers and secure with a toothpick. Remove the skin and ends from the kiwis and slice thinly. 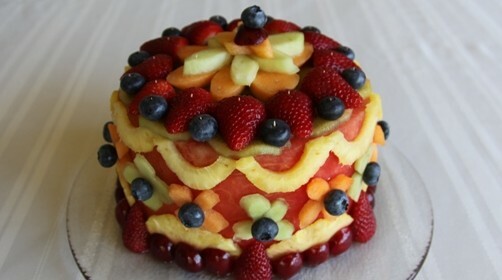 Arrange the thin slices of kiwi on top of the watermelon "cake" and secure with toothpicks. Arrange sliced strawberries along the edge of the top of the cake in a circle and secure with toothpicks. 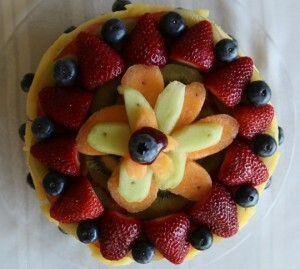 Put a blueberry between each pair of strawberries towards the edge of the top of the cake and secure with toothpicks. Take a slice of cantaloupe and with a paring knife, cut a flower shape large enough to fill the space inside of the ring of strawberries on top of the cake. Take a slice of honeydew and with a paring knife, cut another flower a bit smaller than the first one. Take another slice of cantaloupe and with a pairing knife, cut a flower shape smaller than the second one. Stack the three flowers on top of the cake inside the ring of strawberries with the largest flower on the bottom and the smallest flower on top and secure them with toothpicks. Stick a cherry half and/or a blueberry in the middle of the top flower. If you are using blackberries or raspberries instead of cherries, use that instead, with or without the blueberry on top. The cake holds candles well and slices beautifully. You can serve each slice with a dollop of coconut whipped cream.